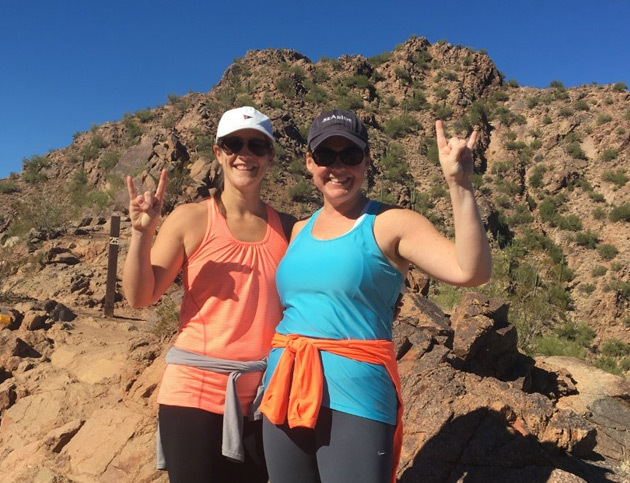 These Longhorn freshman-year roommates celebrated 20 years of friendship together, hiking Camelback Mountain while vacationing in Scottsdale, Arizona. Pictured is Alyssa O’Reilly Constant, BBA, MPA ’01, left, and Stephanie Hill Rogers, BS ’00, Life Members. Stephanie is a preschool teacher in Dallas and a mother of three, and Alyssa has her own bookkeeping business and is a mother of two in the New York City area.